DALLAS, October 30, 2009  Just as buffalo in unimaginable numbers once covered the plains, the Allen High School marching band covers football fields on Friday nights. This season, the Collin County school marches 527 musicians. A 39-member color guard weaves in and out of the ranks. A 72-member drill team performs up front. Bigger marching bands have been assembled for special events. But folks at the University Interscholastic League, the Texas Music Educators Association, Marching.com and Bands of America say they don't know of a regularly performing marching band anywhere that's the size of Allen's. "It's the largest marching band program that I'm aware of," agreed Robert Carnochan, director of the University of Texas Longhorn Band, which has a trifling 390 members. The Allen High marching band has about as many musicians as there are members of Congress. It has five musicians for every one in the Dallas Symphony Orchestra. The 85-member trumpet section is bigger than many high school marching bands. The band, drill team and color guard together are formally known as the Allen Eagle Escadrille (French for "squadron"). For trips, such as last Friday's to Southern Methodist University's Ford Stadium for a game against Jesuit, the 638-student contingent requires 18 school buses. Three big trucks haul instruments and other equipment. When the Allen High marchers take the field, they really take the field, stretching end zone to end zone, leaving little turf exposed. Though a proud, happy throng, they admit that nobody can know everybody in a band so big. "Every now and then you'll see a face you've never seen before," said David McQuiddy, a senior baritone player. 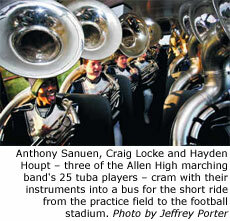 Fans of the Allen High band speak of the "wow factor," and that includes sound. No one has come forward with a decibel reading, but in early morning practices, the band is heard all over east Allen. "It's kind of nice to go out on the back patio and listen to them and have a cup of coffee," said Chelsey Hall. She lives 3.6 miles from the band's practice field. One night in September, Brennan Killingsworth was home watching a Texas Rangers game on TV when he heard the band strike up nearly a mile away at Allen Eagle Stadium. Killingsworth, band director at Ford Middle School, stepped outside and sent a text message to Matt Boening, an Allen High band associate director. "Band sounds good at halftime," Killingsworth wrote, "but tell the trombones their 2nd position D flats are out of tune!" Hearing the band from afar is one thing. Close range is another. "The volume they produce is amazing," said Joe Nunez, director of the McKinney Boyd High marching band. "It can part your hair." That Allen High would have a big marching band is no surprise. Allen High is one of the biggest schools in the state, reflecting rapid growth in the city as well as the school district's decision to stick with one high school. The district also is affluent, with a strong commitment to arts education. But many credit former director Anthony Gibson with establishing the inclusive, accommodating philosophy that helped swell the ranks. Gibson, now in charge of fine arts for the district, still recalls with anger that he was forced as a ninth-grader to choose between band and basketball. As band director, he had a demanding practice schedule, but students who needed to peel off for tennis practice or play rehearsal were allowed. The current director, Charles Pennington, takes the same approach. "There's not just band kids in our band," said Tyler Tryon, a senior trumpet player. The band has even had varsity football players who at halftime doffed their shoulder pads, grabbed their instruments and joined the line. That's not the case this year, but the ranks include Brian Spann, a freshman clarinetist with muscular dystrophy who keeps up using a motorized wheelchair. "I hardly even notice him out there anymore," Pennington said. The size of the Allen High band limits what it can do in routines; and quality control in marching and musicianship is a challenge, especially with scores of freshmen. That matters in marching band competitions, where the Escadrille scores well, but usually doesn't bring home the biggest trophy. "There's good quality in that band, not just quantity, but I don't think competition is what they're about," said Frank Coachman, deputy director of the Texas Music Educators Association. "I think they're about family, and I think that's phenomenal." "Family" is not a metaphor, because parents are a major part of the Escadrille, handling much of the difficult logistics. At any game, nearly 100 are involved, chaperoning on buses, handing out snacks and water bottles, laying out instrument cases and carefully putting away plumes that go with marchers' hats. The band boosters group includes a special-forces unit, the Pit Bulls. These unlikely roadies  clean-cut, middle-aged dads in special T-shirts and work gloves  move the heavy equipment, including the mallet percussion that goes in the "pit" area by the field. Teenagers are not known for expressing gratitude to authority figures, but Tim Love, leader of the Pit Bulls, said he gets four or five thank-yous a game from band members. "Brother, that goes a long way," he said. The band itself certainly doesn't lack for appreciation, including from the Allen High football team. Put 500 or so rabidly partisan teenage musicians in a section near an end zone, and your team doesn't have a 12th man. It has a 12th gorilla. Allen High is the defending state Class 5A Division I champion in football, and in last year's title game, a spectacular blast from the band coincided with miscommunication between the opposing team's center and quarterback. The ball bounced off the quarterback, who was in shotgun formation and looking the other way. The TV commentators credited the Allen High band, and Terry Gambill, the Eagles' defensive coordinator, agrees. "It had a big-time effect," Gambill said. "The quarterback fell on the ball, but they ended up losing yardage." There's a video clip of that play on YouTube, and there are quite a few videos there of the Allen High band. A homemade one titled "Allen High Marching Monster Band" consists largely of the musicians coming onto a football field from a narrow entryway. The bemused female narrator says, "The band that never ends ... They never end ... When will it end?" Members make no apology for their monster band. "It's who we are. It's what we do," said Angela Tomlinson, a senior drum major. The Escadrille will probably get bigger. Growth has slowed, but not stopped, in the Allen school district. This year's band has 59 trombones. Pennington has promised that if the number gets to 76, he'll add the show tune "Seventy Six Trombones" to the repertoire. "We're closing in," he said. And there's still marching room  a little  in the end zones. Story by Sam Hodges and photo by Jeffrey Porter of The Dallas Morning News. Reprinted with permission.